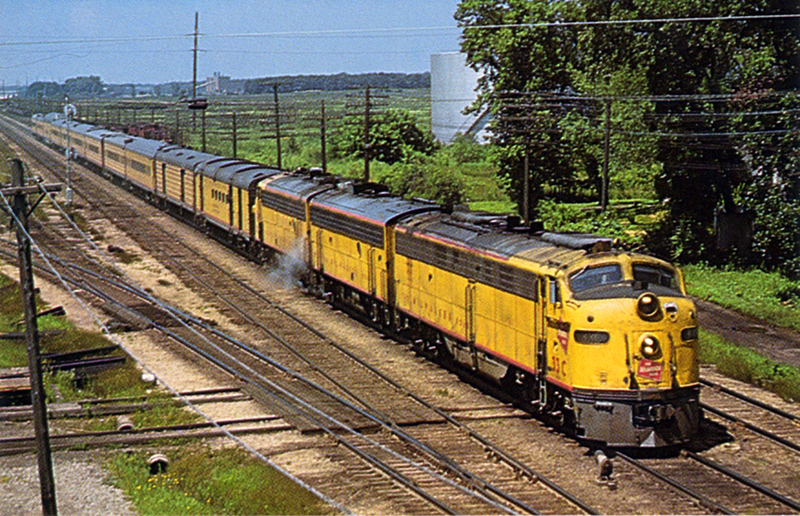 The Milwaukee Road's flat, arrow-straight Omaha main line, comprised of the railroad's Illinois and Iowa Divisions, became one of its most important western connections. The route's prominence grew following the launch of the Midwest Hiawatha just prior to World War II. The train was inspired from the success of the original Hiawatha inaugurated during the mid-1930s and carried the speed and elegance one would have expected from the Milwaukee Road. 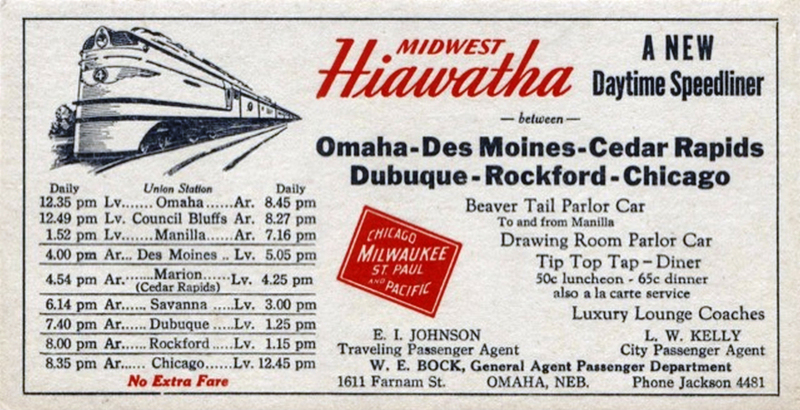 In a bit of irony the Midwest Hi was the last train added to the Hiawatha fleet and the first to be discontinued in the mid-1950s, brought about after Union Pacific switched to the Milwaukee as its Chicago connection for the former's famed City streamliners. Sadly, the once double-tracked, high-speed route the Midwest Hi plied across the Midwest is also but a memory. The Midwest Hiawatha officially entered service on December 11, 1940 amid a great deal of fanfare and celebration with events similar to those held in celebration of the original Hiawatha back in the spring of 1935. As Brian Solomon and John Gruber note in their book, "The Milwaukee Road's Hiawathas," interest in the new train was so high that a railfan group based in Des Moines, Iowa (a town the Midwest Hi did not serve) sponsored an excursion in an old wooden coach to Madrid in hopes of seeing the new streamliner during its layover there. The train was a near replica of the original trainset featuring a six-car consist and powered by a pair of streamlined Class A 4-4-2s, #3 and #4, once assigned to the Hiawatha (only these two trains used the Atlantics for power, all four of which were built by the American Locomotive Company). 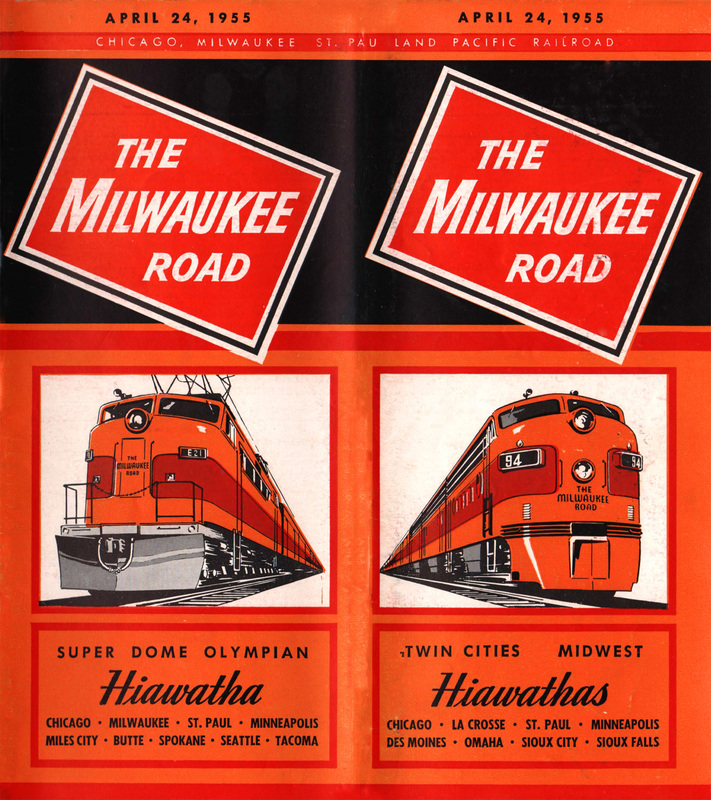 The Milwaukee Road, "Route Of The Hiawathas"
By the time the Midwest Hi hit the rails much of the public was already fully aware of the Milwaukee's legendary streamliners with speeds eclipsing 100 mph, arguably the fastest trains under steam in the nation. A good advertising and marketing campaign also didn't hurt, which the railroad took full advantage of through print media. One particular piece from 1935 noted the following: "A silver and orange flash... America's first completely streamlined super-speed steam locomotive. Designed and built especially for the Hiawatha. Nothing faster on rails! Every car air conditioned... Streamstyled for speed - yet setting a new standard of spaciousness and comfort. Exclusive features include Beaver-Tail Parlor Car and Tip Top Tap Room. Silent roller bearings on every wheel." This advertisement goes into further detail about the train that included some comments which may have been of little or no interest to travelers at the time but certainly are fascinating all these years later: "The powerful, oil burning locomotive of the Hiawatha is completely streamlined... fitted with giant seven foot driving wheels... develops boiler pressures of 300 pounds per square inch, about 50% higher than standard... cruises easily at 100 miles per hour and is capable of a top speed of 2 miles a minute. Roller bearings on each wheel of locomotive and tender. The sturdy steel parlor cars, coaches and restaurant-buffet are one-third lighter in weight than conventional cars. They are all air conditioned; quite and smooth-riding. Hiawatha type coaches are in themselves a great advance in railroad design providing one-third more room per passenger." "On the Hiawatha you'll enjoy famous Milwaukee Road meals in a new and novel dining car. Adjoining is the unique Tip Top Tap Room with its club-like atmosphere and appointments. Fleeter than the mighty hero of Indian legend, The Milwaukee Road's Hiawatha speeds through Wisconsin's lakelands and along the scenic Mississippi, creating a new ideal of fast, luxurious travel." The Midwest Hiawatha was officially christened for service in Omaha by Sandra Bock, granddaughter of Omaha's general passenger agent W.E. Bock. All along the train's route other celebrations were held at Sioux Falls, South Dakota and Sioux City, Iowa (a section split at Manila, Iowa to reach these locations). Its consist was typical of the Hiawathas including an express car, reclining seat coaches, a tap-diner (later a diner-lounge was added), and a classic "Beaver Tail" parlor-observation. For those interested in a summary of the equipment used on the Midwest Hiawatha Jim Scribbins' book, "The Hiawatha Story," provides all of this information in great detail from car names and build date to their layouts, numbers, and final disposition. After Electro-Motive convinced the Milwaukee Road of the diesel's superiority following successful demonstrations with its E6 model the railroad purchased a set, #15A-15B for use on the Chicago-Twin Cities corridor. As a result steam was to play a continually declining role after only a few years in service, an unfortunate fate for such beautifully crafted and technology-advanced machines. The onset of World War II precluded the Milwaukee from purchasing more diesels during that time but after the conflict had ended new locomotives were ordered as soon as the company was able. On June 14, 1946 Electro-Motive E7As took over on the Midwest Hiawatha and two years later, on July 2, 1948 it received new or upgraded equipment. In typical fashion the new diesels zipped the train across the prairies and through the Heartland at up to 100 mph. Like most railroads the Milwaukee anticipated a resurgence and sustained interest in rail travel after the war, which never came. To the Road's credit, however, service remained top notch even during the darkening days of the 1960s. Unfortunately, the Midwest Hiawatha's end came abruptly. 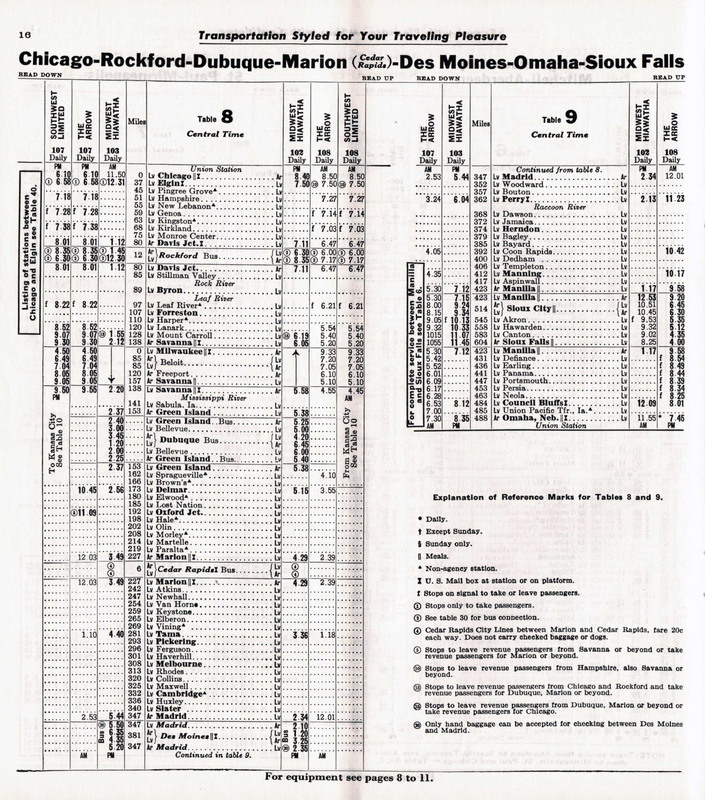 Following an agreement with the Union Pacific to handle its transcontinental streamliners between Chicago and Omaha (including the City of San Francisco, City of Denver, City of Los Angeles, and City of Portland) starting October 30, 1955 the Midwest Hi ran for the last time independently the day prior (October 29th). Technically, the Milwaukee considered it combined with with the City trains but effective it was gone. 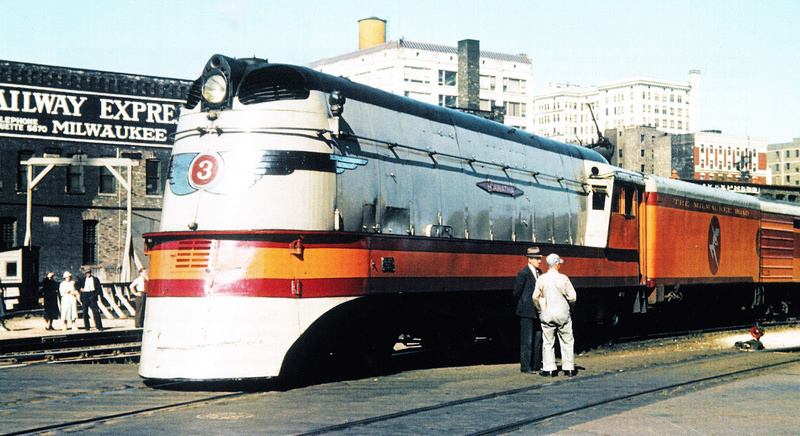 The separate Manila-Sioux Falls section continued in service for another few months until it, too made its final run on April 29, 1956. The partnership with UP ended years of cooperation with the Chicago & North Western dating back to the early 20th century when the two roads had often worked together to provide transcontinental service. 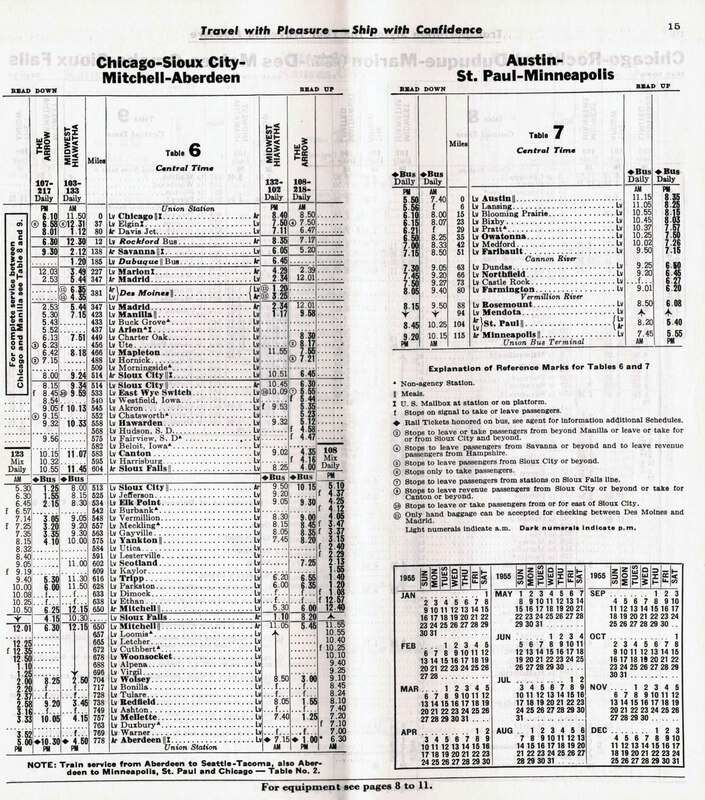 According to The Milwaukee Road Magazine opening day went very well and the UP-Milwaukee Road connection continued strong until Amtrak took over intercity operations on May 1, 1971. Sadly, even the Milwaukee's high-speed route to Omaha is now mostly a memory through Iowa, returned to farm fields and pastures following its abandonment after the railroad fell into bankruptcy during the late 1970s.